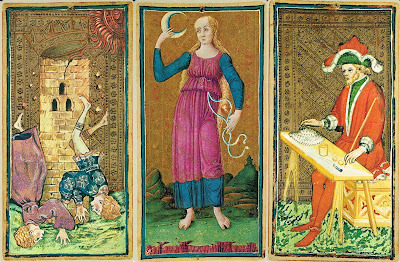 The name Visconti Tarot is used collectively to refer to incomplete sets of approximately 15 decks from the middle of the 15th-century, now located in various museums, libraries, and private collections around the world. No complete deck has survived. For those three of them, which have the most surviving cards, exist today reprints. One, which is named the Brera-Brambilla is located in the Pinacoteca di Brera in Milan it was painted for Filippo Maria Visconti, another is named the Visconti di Modrone pack and belongs to the Cary Collection at Yale University. At least the numeral cards for this pack were also painted for Filippo Maria Visconti, though it may be that the trumps and court cards are of a later date. The third deck, which is referred to as the Visconti-Sforza, was painted for Francesco Sforza, who was married to Filippo Maria Visconti's only child Bianca Maria. From this pack the Pierpont-Morgan Library in New York has 35 cards, the Accademia Carrara has 26 in its catalogue, while the remaining 13 cards are in the private collection of the Colleoni family in Bergamo. 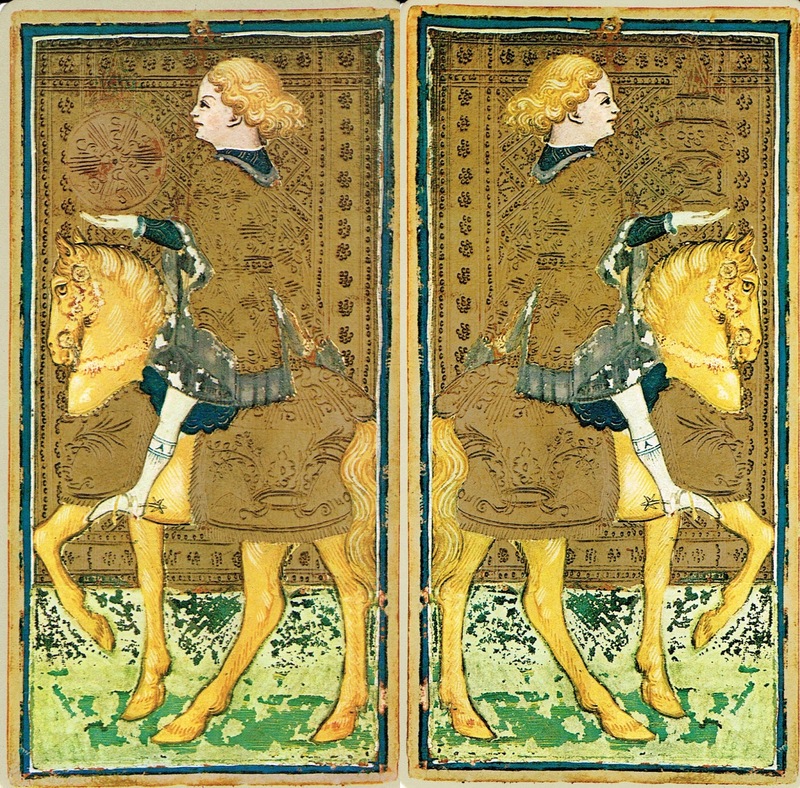 "Das Tarockspiel der Visconti" is a reprint/restauration of the Visconti-Sforza Tarot. The original Italian edition from 1974 by Monumenta Lomgobardica was named "I Tarocchi dei Visconti", this is the German edition from 1977 printed by Grafica Gutenberg. It's a limited edition of 400, mine is number 3. It is not sure, who the artist(s) for the Visconti decks were. Sometimes Bonifacio Bembo gets credited with the artwork, other scholars attribute the cards to Francesco Zavattari. The Visconti-Sforza pack contains 74 cards, the four cards missing are The Devil, The Tower, Three of Swords and Knight of Coins. 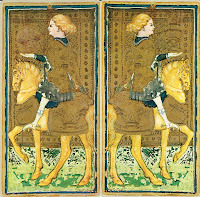 The replacement for the Knight of Coins was created by using a reversed image of the Knight of Cups and substituting a coin for the cup in the knights hand. 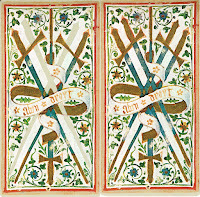 The Three of Swords was made by erasing the two inner crossed swords from the Five of Swords. The Devil and The Tower were recreated in full color in a style as they may have appeared in the fifteenth century. The artist who recreated the missing cards is not named. 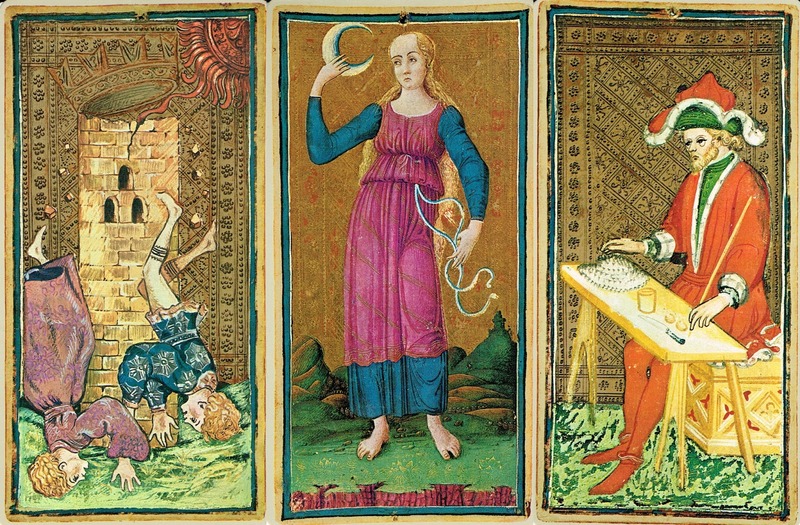 Six of the cards ( Fortitude, Temperance, the Star, the Moon, the Sun and the World ) in this deck are likely made by a different artist than the other cards, four of those six later cards have the feature that in the foreground the earth terminates abruptly in a vertical cliff. The pin holes at the top of each card do suggest that they were given or lent as artist’s models to other painters (this possibly explains how four cards are now missing). There are several incomplete sets, which contain one or more cards copied from this deck, sometimes reversed, sometimes with the original orientation. 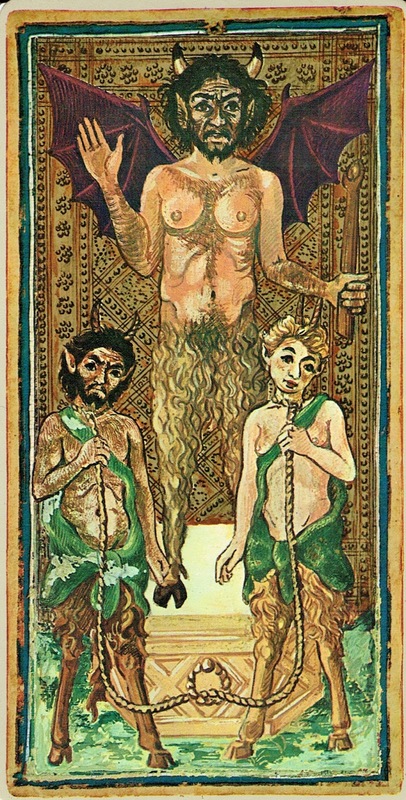 Many cards contain either heraldic motifs or inscriptions such as “a bon droyt” or “amor myo”.The figures on the suit of bastoni wear silver pleated garments and carry a long staff. Those on the suit of cups wear gold garments, embellished by the heraldic device of sun and rays; each figure holds a large chalice. 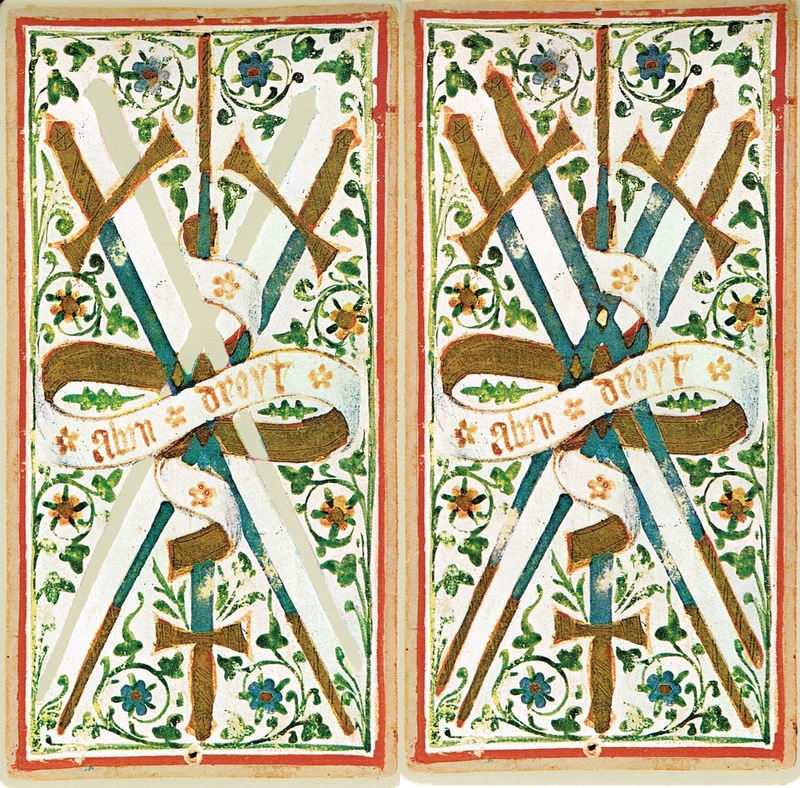 The suit of swords shows figures dressed in full armour, carrying a large sword. The characters represented on the suit of coins wear garments decorated with blue ribbons wound around circular suns. The Knight of this suit is the only one not wearing a ducal crown.